Vickie Britton, along with her sister Loretta Jackson, is the author of over forty novels. The sisters have co-authored the Jeff McQuede High Country Mystery Series: Murder in Black and White, Whispers of the Stones, and Stealer of Horses. 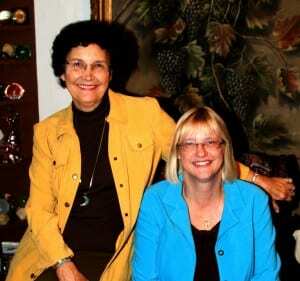 They have also written the eight-book archaeological Ardis Cole Mystery Series and the Pre-Columbian Treasure Series. Vickie’s interests include history and criminal justice. She lives in Hutchinson, Kansas. My sister and I are drawn to out of the way places. We like to explore old ruins and hear about unique legends. Our overseas travel has provided a background for our archaeological series while travel in Wyoming has inspired our books with a western setting. Because there are two of us, we rely on an outline for our plotting. We don’t use a program, only a pen and blank piece of paper. We usually outline the events that go in every chapter so that each part of the novel will work toward the ending. Sometimes we make changes as we go along if they are needed or if a new idea develops that we both agree on. In the process of writing, characters become very real, and often they get a mind of their own. When this happens, my sister and I have learned to listen because it is often a warning sign that the book needs to take a different direction. The character is usually right. Write the book of your dreams and then try to sell it. Follow your intuition. If you find a subject fascinating no doubt others will, too. Books usually appeal to those readers who share your interests. The writing life is full of surprises. You have to write more than one book, and be patient. For most of us, success doesn’t come overnight. Our decisions are based on making the best choice possible for each individual project. Some books do well with traditional publishers while others have a more limited readership and are better suited to independent publishing. The ebook reader and print on demand has changed the course of publishing, probably forever. There are more publishing choices than ever before, so it’s a good time to be a writer!